say thank you. Every time you breathe out, say goodbye. The thing about my father is I wear my sadness like the inside of a jar. How can you not see inside of it? How the slightest bit of air destroys me. XXXXXXXXXXXXXXXXXXXXXXXXXXX and in this way the world was created. “One God”: Let us make human beings in our image, to be like us. 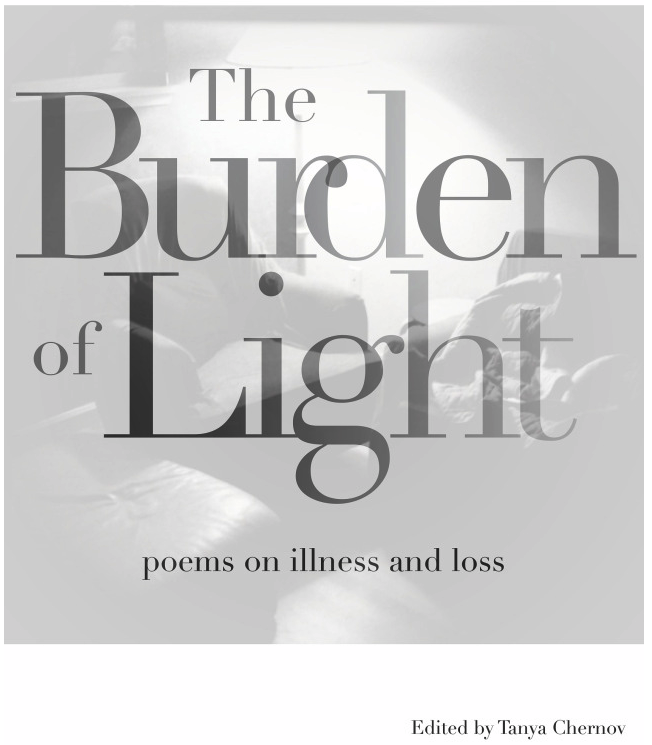 Today’s poems are from The Burden of Light: Poems on Illness and Loss, available by donation on Smashwords and Amazon. These poems appear here today with permission from the poet. The Burden of Light: Part poetry anthology, part field guide, part multimedia art collection, The Burden of Light offers its readers companionship through the darkest days. With work by artists who have confronted serious illness or grief in their own lives, the poems and artwork in these pages hold the power to touch the heart, stir the mind, and heal the spirit, each in its own way. These pieces illuminate the vital force of our humanity, while encouraging us to reach out to others in need. With 100% of the proceeds benefiting the National Colorectal Cancer Research Alliance, even a small donation from one has the power to affect change when added to the contributions of others. Colorectal cancer is the second leading cause of cancer-related deaths in America, yet this cancer is largely preventable when detected early. By supporting the groundbreaking work of the NCCRA, we’re all helping to promote regular medical screening and fund the research needed to develop better tests, treatments, and ultimately, a cure. Just as The Burden of Light is designed to help readers move forward from trauma, so too will donations help those currently experiencing serious illness. Editor’s Note: Yes, yes, today’s poems are a first here on the Saturday Poetry Series in that they are written by your faithful editor. I am honored to be featured in this anthology alongside a plethora of talented artists, including SPS-beloved poet Peggy Shumaker. But beyond sharing a little of my own work with you here for the first time, I wanted to share with you this important collection. Whether you purchase it for your Kindle or download it as a PDF, you get to decide how much you want to pay for this anthology, and 100% of the proceeds benefit the National Colorectal Cancer Research Alliance. Via the Kindle edition or PDF you will find links to listen to the poets read their poems aloud, for an added layer of experience and immersion. This is a thoughtful, powerful, philanthropic endeavor with the power to both move the reader and effectuate change. Check out the full anthology for more poems by yours truly and many more talented poets writing through their own experiences with illness and grief. Please donate what you can, and then go forth and read! Want more from The Burden of Light? This entry was posted in Peggy Shumaker, Saturday Poetry Series, Sivan Butler-Rotholz, The Burden of Light and tagged American Poetry, book-length poetry, Inspirational Poetry, Motivational Poetry, nostalgic poetry, Occasional Poetry, Poetry, Poetry & Art, Poetry of Loss, Poetry on Illness. Bookmark the permalink. ‘Let us make human beings in our image, to be like us.’ ! ‘Flowers are like that.’ Superb. Mazal Tov! All that and All the proceeds donated. G-d/-dss likes that, I too.